We spent a little while looking for a hotel in Niš before our trip. There are not many available yet. We chose the Regent Club Hotel. 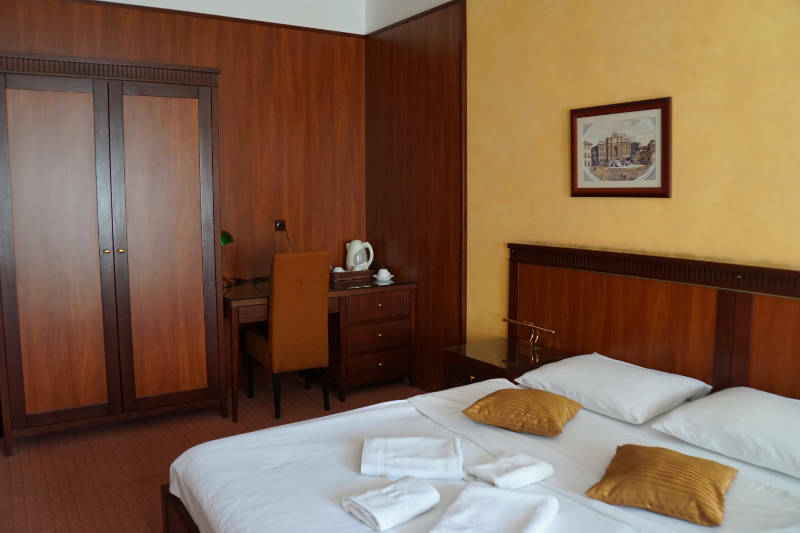 The Regent Club Hotel in Niš is located in a pedestrianised area and a is a five-minute walk away from the Niš Fortress. Despite this location, it is not very easy to find and we were most grateful that our airport taxi dropped us off right there. The main entrance of the hotel is in a backyard. A driveway leads up to a car park in the backyard. The car park also has parking spaces for the hotel guests. The first impression is not particularly inviting, but as we quickly learned, this is true for many locations in Niš. The hotel and the reception area can be entered via the car park. A little later we discovered a second entrance to the hotel. 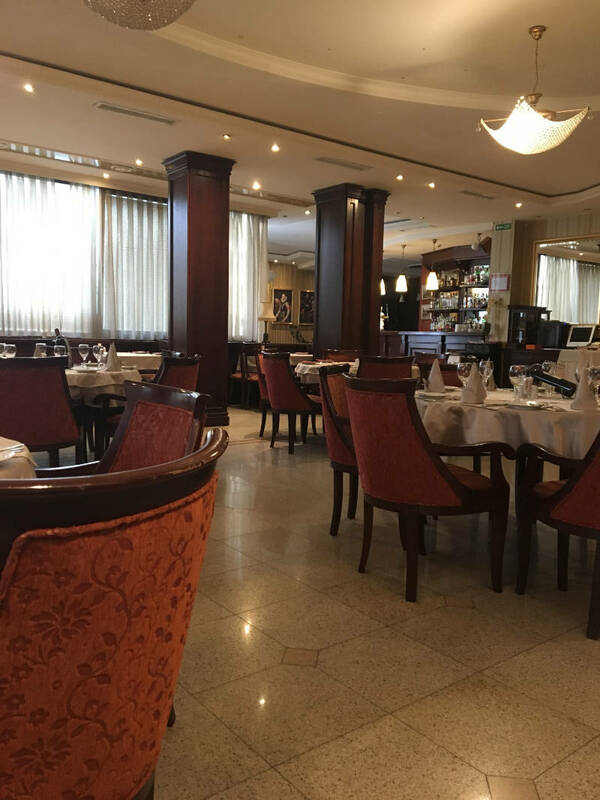 Through a little passage with some travel agencies, one can enter the hotel restaurant and from there the hotel. Our room was on the first floor with a view of the car park. Not a very nice view, but the other rooms had a view of the little passage and that was not necessarily better. We booked a double room. We got a huge room with three beds. Aesthetically, there was a resemblance to the looks of the old Eastern Bloc. Uniform carpets, dark furniture and all a bit outmoded. The bathroom, although very clean, was proof that tourism has not yet arrived in Niš. The modern shower was missing some parts and even if they had been there, due to lack of pressure the water was more dripping than flowing. I for sure felt comfortable in the room. It was clean, it was big, the bed was comfy and I slept very well. Everything was just a little old and to pull in more tourists there are certainly some modernisations needed. A huge benefit of the hotel: Free Wi-Fi in the entire house! Breakfast was served in the restaurant of the Regent Club Hotel. The first impression was the same as for the rest of the hotel, very outmoded. The breakfast buffet was lovingly arranged on a small table. The food was good and reasonable quantities were available. Bread, musli and fresh fruit were served daily. To drink, they had juices, tea and coffee. Food in Serbia is quite hearty, so there was no shortage of breakfast meats and cheese. We liked the breakfast and it fuelled us for the day. We slept very well. The hotel is very well suited for city tours.